We welcome members of the media to the NASFAA National Conference. Be sure to check back for more information on featured speakers and a list of key sessions with subject matter that may be of interest to your readership as the conference grows nearer. 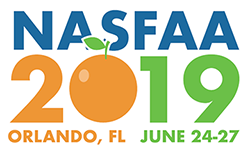 To request a complimentary media registration, please email powerse@nasfaa.org. NASFAA Social Media - Follow along on our social media platforms to keep up on current hot topics. NASFAA Press Room - View NASFAA's latest press releases and check out recent press clippings featuring NASFAA, as well as op-eds written by NASFAA staff that have been published by local, national, and online news publications. NASFAA's Policy Positions - Learn more about our positions and jump directly to recommendations on specific federal student aid programs. NASFAA On the Record - Here you'll find a collection of positions NASFAA has taken on federal budgeting, regulatory, and legislative action related to financial aid.